Royal Caribbean International officially took delivery of the 26th ship in its fleet, Spectrum of the Seas, in a ceremony held yesterday in Bremerhaven, Germany. The first in the Quantum Ultra class of ships, Spectrum will homeport from Shanghai starting June 2019. Royal Caribbean’s first exclusive suites-only area, which will feature the Golden and Silver suite accommodations in a private enclave at the forward end of the ship on decks 13 through 16. Vacationers booked in these luxury suites will have special keycard access, a private elevator and a dedicated restaurant and lounge. In addition to a range of exclusive amenities, guests will have access to The Balcony – a private outdoor space for sunbathing and relaxing – that offers the best views on board; and The Boutique, a shopping area where travelers can book private shopping experiences. The two-level, 2,809-square-foot Ultimate Family Suite accommodating up to 11 guests. The three-bedroom suite includes a master bedroom and two additional bedrooms for grandparents and other family members. Kids have their own kid-friendly space on the upper level, complete with an in-suite slide that will transport them to the living area below. Everyone in the family can enjoy time together in the recreation room, featuring surround-sound equipment for a night of karaoke, movies and video games. Innovative dining concepts Sichuan Red– with authentic cuisine from the Sichuan province of China, Wonderland’s Dadong – a new outpost of Chinese chef Dong Zhenxiang, renowned for his much-coveted roast duck; and the Leaf and Bean traditional tea room and café parlor offering a range of authentic Chinese teas, classic coffee drinks as well as freshly baked Chinese and western desserts and pastries. Debuting on Spectrum, a new karaoke venue, Star Moment, where family and friends can belt out and sing like stars (well, in their own minds). An enhanced SeaPlex, the largest indoor sports and entertainment complex at sea, where families can enjoy bumper cars, roller skating, basketball, and new augmented reality walls and floors, providing guests with high-tech interactive experiences. The Sky Pad, a virtual reality bungee trampoline experience located on the aft of the ship, as well as Quantum Class favorites: the North Star, a glass capsule that takes guests more than 300 feet above the ocean for incomparable panoramic views; RipCord by iFly, a heart-pounding skydiving simulator experience; and the FlowRider surfing simulator. Other venues, such as Two70 with its expansive floor-to-ceiling windows offering breathtaking 270-degree views of the ocean. Two70 features its signature Vistarama technology, which transforms the panoramic windows into a projection surface more than 100 feet wide and over 20 feet tall to showcase spectacular digital shows. Six agile Roboscreens, measuring over 7 feet tall and controlled by powerful, yet nimble robotic arms, create scenes as they soar and twist solo or as one. Two70 will also feature new room-scale augmented reality experiences that transport vacationers to new worlds of adventure. Accommodating 4,246 guests at double occupancy and 1,551 international crew members, Spectrum will be the largest and most expensive ship in Asia when she arrives to her new home in Shanghai on June 3, 2019. Before Spectrum arrives to her new home this summer, she will sail a 46-night Global Odyssey from Barcelona, Spain to Shanghai, taking guests to an array of ports, including Aqaba, Jordan; Dubai, UAE; Muscat, Oman; Cochin, India and Georgetown, Malaysia. In winter 2019, the ship will reposition to Hong Kong to offer special holiday cruises. Let’s play Family Feud Live!™ Carnival Cruise Line today announced it will debut the seagoing version of the iconic TV game show Family Feud™ as part of the entertainment lineup on the highly anticipated Mardi Gras, when it enters service in 2020. As Carnival Sunrise makes her debut following a $200 million transformation, Carnival Cruise Line announced today that Kelly Arison, daughter of Carnival Corporation Chairman Micky Arison and his wife Madeleine, will serve as godmother for the ship at an invitation-only ceremony in New York on May 23. Kelly will step into the godmother role previously held by her mother when the ship first entered service as Carnival Triumph in 1999. In an added stroke of family ties, Kelly’s grandmother Lin Arison served as godmother to Carnival Sunrise’s sister ship, Carnival Sunshine, in 2013. Carnival Cruise Line bartender Sanja Cvijetic won the 2019 BACARDÍ® Legacy Cruise Competition in San Juan, Puerto Rico, competing against more than 2,000 entries from major cruise lines’ top bartenders worldwide. This marks the fourth time in the past eight years that a Carnival mixologist has earned the coveted award. The BACARDÍ® Legacy Cruise Competition is an annual global search to find the best bartender in the cruise industry with a cocktail that can stand among Bacardí’s heritage classics. This was Cvijetic’s first bartender competition. Cvijetic, a 31-year-old from Bosnia who is currently aboard Carnival Conquest, took home the gold for her custom-created libation, “Purple Sunset,” a signature cocktail mix of Bacardí Superior, Monin® Lavender Syrup, lemonade, fresh lime juice, MARTINI Prosecco® and fresh rosemary. In addition to a $4,000 cash award and an etched trophy, Cvijetic’s victory earned her a spot in Bacardí’s global finals this May in Amsterdam where she’ll compete against 38 domestic market winners for the ultimate title. Royal Caribbean Cruises Ltd. (NYSE: RCL) today announced that it has entered into an agreement with French shipbuilder Chantiers de l’Atlantique to order a sixth Oasis-class ship for delivery in the fall of 2023. This order is contingent upon financing, which is expected to be completed in the second or third quarter of this year. Virgin Group Founder Sir Richard Branson and Virgin Voyages President and CEO Tom McAlpin announced today that Virgin Voyages is officially open for business, with the company’s first ship, Scarlet Lady, now open for bookings for her inaugural season, with voyages departing from April 1 through October 25, 2020 now on sale. Virgin Voyages will offer a new approach to service, as well as an inclusive approach to sea travel that removes the always annoying nickel and diming so prevalent on other cruise lines. Virgin calls cruise guests “Sailors”, and the cruise price paid for each sailor will feature all the food at the 20+ eateries onboard, group fitness classes, no gratuities or service charges, free Wifi and free basic beverages like soda, teas, and drip coffee, as well as still and sparkling water. While on ship, Virgin Voyages Sailors will have the opportunity to choose from a festival-like lineup of all-new completely original Events & Gigs developed by some of the world’s most-talked about producers, directors and artists in the expansion of the company’s Creative Collective. Virgin Voyages’ entertainment Creative Collective includes Jenny Gersten, Randy Weiner, Sam Pinkleton, Ani Taj, PigPen Theatre Co, The 7 Fingers, Roslyn Hart and Alfredo Guenzani and the Spark Cooperative. A cornerstone of every voyage will be The Beach Club at Bimini, where sailors can feel the sand in their toes in a stylish setting with white-sand and crystal clear waters and programming that will rival the best beach clubs in Ibiza and Saint-Tropez. Just a short transfer from the pier, and built by Resorts World Bimini, The Beach Club at Bimini is designed with Miami-based architects EOA, Inc., featuring natural materials and soft earth tones that organically blend into the seascape. The Beach Club at Bimini will overlook the ocean and cascade down to the sea with an expansive lagoon-style pool as the central anchor of the club. In the spirit of Vitamin Sea, the brand’s ethos of well-being, there will be moments of retox and detox throughout the day. Sailors will find areas of high energy and quiet spots for complete relaxation and introspection. Mornings at The Beach Club at Bimini will begin with yoga and meditation as Sailors enjoy the sounds of the ocean. The energy at The Beach Club at Bimini will be gradually amplified as the day progresses and turned back down as dusk settles in. Sailors will reach the high point of the day by the afternoon where DJ-led pool and flotilla parties will be center of the action. The night’s energy will wind down with a beach bonfire to close out the evening with an acoustic musical performance. 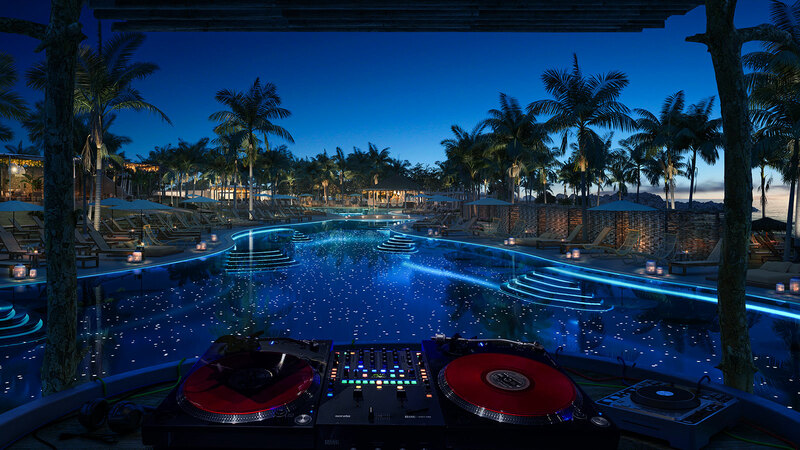 With music at the heart of the Virgin brand, Virgin Voyages will carefully curate the soundtrack for The Beach Club at Bimini, with seven-time Grammy-Award-winning artist and producer Mark Ronson named founding DJ, where he will be among the first talent to grace the turntables. Ronson, the British-born DJ, producer and songwriter, has topped the charts and collaborated with artists like Amy Winehouse, Lady Gaga, Adele, Miley Cyrus and Bruno Mars. Ronson will have four performances in 2020, with specific performance dates to be announced soon. The Beach Club will also have complimentary food that is thoughtfully sourced. Its locally inspired menus will serve up island favorites such as conch and mango salad, banana leaf-wrapped queen snapper, Bahamian rum cake and more. day can enjoy the many beach loungers, or opt for a more private place to cuddle up, with beach-side and poolside cabanas available for rent. The Beach Club at Bimini will also feature active areas for watersports and beach play. 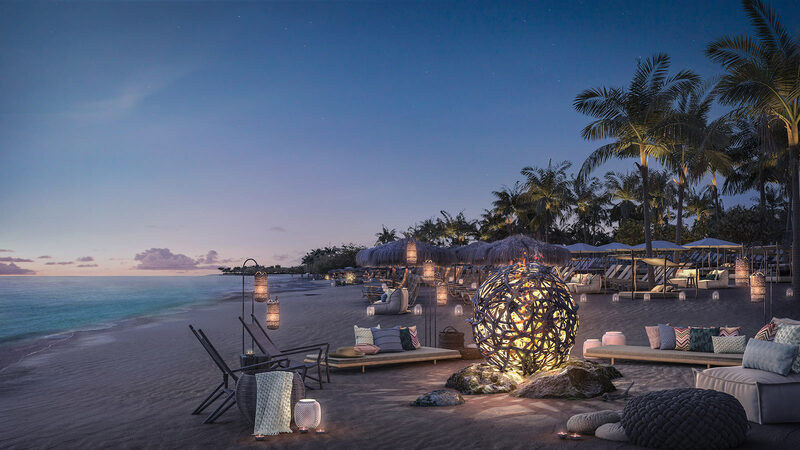 Sailors staying in RockStar Suites will have their exclusive slice of paradise at The Beach Club at Bimini, with a dedicated bar, complimentary food service, an outdoor terrace lounge, sun loungers and beach cabanas. Sailors looking to explore the island of Bimini will have ample opportunities to do so in this off-the-beaten path tropical destination. The island is a beach-lovers paradise with welcoming and warm residents. It was a known favorite of author Ernest Hemingway, who described it as “like the end of the world.” This intimate seven-mile island offers extraordinary sea experiences such as boating, snorkeling, and even wreck diving, with the SS Sapona just a few miles off the coast of the southern part of the island. Scarlet Lady will feature a festival of choice in entertainment made up of bespoke intimate and authentic Events & Gigs created exclusively for Virgin Voyages, with the goal of providing Sailors with an alternative perspective on the world and play that ignites the spirit within. Sailors won’t just sit and watch shows, they may be asked to participate with the cast or become immersed in the world of the performance. In keeping with Virgin Voyages’ rebellious nature, the company will have no traditional cruise director on board the ship, and instead will have a dynamic group of individuals dedicated to making “Happenings” around the ship completely epic. From modern takes on classic stories, to interactive dance parties and off-the wall participatory acts, the experiences will break down the fourth wall and push the boundaries of traditional stage performances. Virgin Voyages’ entertainment goes beyond Broadway with first run experiences that have never been seen before on land or at sea. To accommodate its variety of entertainment opportunities Virgin Voyages created The Red Room — designed by renowned architects WorkAC and theater consultants Auerbach Pollock Friedlander — as the first transformational multi-form theater at sea. 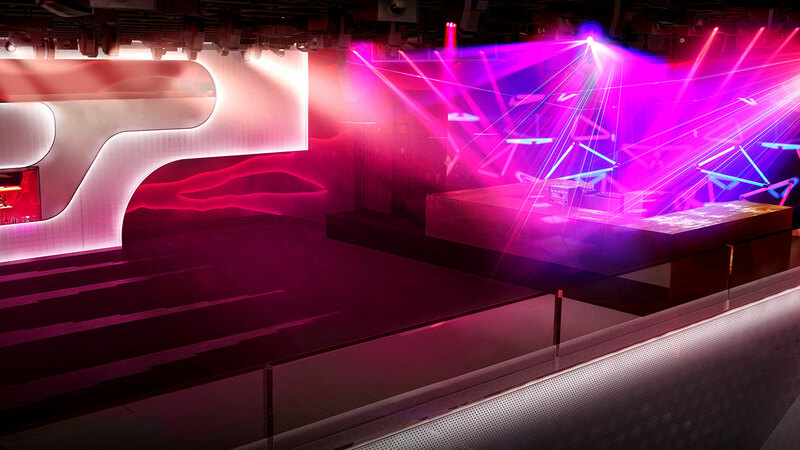 It will transform into four different configurations – a traditional Proscenium stage, an alley stage used in fashion shows, a dance flat-floor configuration, and finally a unique reverse stage setup. This first at-sea theater will enable Virgin Voyages to create completely different experiences for each day of the voyage. Scarlet Lady will feature six original shows that include a soon to be announced production by award-winning producer Randy Weiner (Queen of the Night, The Donkey Show, Sleep No More). Sam Pinkleton & Ani Taj have created a hype music video disguised as an absurdist style dance party, called UNTITLED DANCESHOWPARTYTHING. Phantom Folktales is a collection of song driven micro plays throughout the ship that seemingly appear out of thin air, and disappear just as quickly, created by PigPen Theatre Co. Ships in the Night is an emotion-filled contemporary experience telling its story through the use of cutting edge digital projection interwoven with the authenticity of the human condition, and Duel Reality examines the age-old tale of Romeo & Juliet with a modern twist featuring acrobatic storytelling. Both performances were made possible through our collaboration with the innovative circus company, The 7 Fingers. straight-talking relationship therapist, Dr. Alex Shiller, by producers Roslyn Hart and Alfredo Guenzani. Additionally the creative development, production and installation of “happenings” that will take place throughout the ship were created by Spark Cooperative. To add to the overall vision, Tony Award winning creative producer, Jenny Gersten, will serve as an artistic and production liaison between the core in-house Virgin Voyages Entertainment team and other members of the Collective. 31, 2019 by visiting RichardsBirthday.VirginVoyages.com. Scarlet Lady is a boutique-style, mid-sized ship designed to reflect a yacht’s sleek luxury and will set sail from PortMiami for her 2020 inaugural season on unforgettable four and five-night voyages to Havana, Cuba; Puerto Plata, Dominican Republic and Costa Maya, Mexico. You can follow Virgin Voyages on social media via @virginvoyages on Instagram, Facebook, Twitter or LinkedIn. Nieuw Statendam Dedication with Godmother Oprah Winfrey at Port Everglades on February 2, 2019 in Fort Lauderdale, Florida. In an event rich with inspiration and tradition, Holland America Line held a dedication ceremony for Nieuw Statendam Saturday, Feb. 2, 2019, at Port Everglades in Fort Lauderdale. Oprah Winfrey officially named the ship in a ceremony on board in the ship’s World Stage. During the daytime celebration, Winfrey was joined by Orlando Ashford, president of Holland America Line; Stein Kruse, Holland America Group and Carnival UK chief executive officer; and Arnold Donald, president and CEO of Carnival Corporation. Nieuw Statendam’s dedication ceremony followed the three-day Girls’ Getaway cruise to the Caribbean that celebrated the power of female relationships. Gayle King, editor-at-large of O, The Oprah Magazine and Winfrey’s best friend, joined her on the cruise, along with several other senior editors from the magazine. Winfrey reflected on the Girls’ Getaway cruise that had just concluded, saying “It’s been an incredible experience to see people from across the world come together with one mind and celebrate themselves, honor themselves and honor each other. Everybody gathered, made friends and connected to people they didn’t know because they felt like they had met themselves on some level. I have never seen anything like it.” She then officially dedicated the ship as its godmother with the traditional statement, “I name this ship Nieuw Statendam. May God bless her and all who sail on her.” The ceremony concluded when Winfrey triggered the release of the traditional bottle of Champagne that broke against the ship’s bow. Following the ceremony, a Gala Dinner was held on board. During the evening celebration, guests were invited to participate in a maritime tradition of pouring Champagne over the ship’s bell as a blessing. This ceremony was a recreation of the bell ceremony on Holland America Line’s s.s. Statendam IV on January 23, 1957, when a then-18-year-old Dutch Crown Princess Beatrix poured Champagne over the bell to officially dedicate that new ship as it sailed in the North Sea. Nieuw Statendam is the sixth ship in the company’s history to bear the name. Nieuw Statendam was delivered from Fincantieri’s Marghera, Italy, shipyard Nov. 30, 2018, and currently is sailing its inaugural season from Ft. Lauderdale to the Caribbean through April 2019. Following a transatlantic crossing, the ship will spend the summer exploring Norway, the Baltic and Iceland on cruises sailing roundtrip from Amsterdam, the Netherlands. Come fall, the ship will make its way to the Mediterranean and offer a series of cruises roundtrip from Civitavecchia (Rome), Italy. The new 2,666-guest ship has an ambiance that balances fresh, contemporary styling in perfect harmony with the line’s renowned classic elegance. At the helm of the design and interiors are internationally acclaimed hospitality designer Adam D. Tihany and Bjørn Storbraaten, one of the world’s leading architects working in the cruise industry. Nieuw Statendam offers an abundance of unforgettable dining options. Award-winning cuisine is served in the stunning Dining Room; and an array of specialty restaurants feature exclusive experiences such as steak and seafood at Pinnacle Grill, authentic Italian cuisine in Canaletto, the culinary traditions of Southeast Asia at Tamarind and Nami Sushi, and a contemporary twist on French seafood classics in Rudi’s Sel de Mer. The innovative Music Walk on Nieuw Statendam showcases a variety of live musicalexperiences and genres unlike any other at sea, including Rolling Stone Rock Room, Lincoln Center Stage, Billboard Onboard and B.B. King’s Blues Club. Get ready to ride! In another cruise industry first, Carnival Cruise Line’s new Mardi Gras™ will feature the first-ever roller coaster at sea when it debuts in 2020. Built by Munich-based Maurer Rides, BOLT™: Ultimate Sea Coaster™ offers nearly 800 feet of twists, turns and drops with riders reaching speeds of nearly 40 miles per hour. BOLT is an all-electric roller coaster that allows two riders in a motorcycle-like vehicle to race along a track 187 feet above sea level. BOLT begins with a launch where riders can achieve race car-like levels of acceleration and culminates with a high-powered hair-pin turn around Carnival’s iconic funnel. Riders’ speeds are posted after the race, and just like land-based roller coasters, guests have their photo taken during the ride for a memorable keepsake. And since guests choose their own speed, each ride is unique. Carnival has teased in social media that the BOLT roller coaster is just the first of other new features coming to the ship. Mardi Gras will be based in Port Canaveral, Fla., which will feature a new state-of-the-art terminal. Itinerary information will be revealed early next month with additional details about Mardi Gras’ groundbreaking features announced throughout the year. A second XL-class ship will start construction in 2020 and be delivered in 2022 to mark the 50th anniversary of Carnival Cruise Line’s founding.